We write as external examiners whose role is to assure the quality of higher education courses at universities and colleges across the UK, but who have decided to resign in order to support the campaign for fair pay in our sector. We have resigned because, while as senior academics we believe our role in underpinning the quality of education provided to students is vital, we are all too aware of the unfairness of the current pay policies of our universities and their impact on staff and their students. We have watched with sadness the pay of academic and professional staff fall in real terms by 14.5% since 2009; we have seen the numbers of casual staff proliferate; and seen universities do little or nothing to reduce the shocking gender pay gap despite having a collective surplus of £1.85bn. Yet the final straw for many of us is the contention by our employers that the latest final pay offer of 1.1% is “at the limits of what can be afforded” when at the same time we discover that university leaders have themselves received an average pay increase of 6.1%. The blatant hypocrisy of this position is breathtaking. We love our work as external examiners not least because it brings us into contact with academics from around the country. The high-quality work we see confirms to us that staff deserve better from institution heads. We have therefore resigned from our external examiner posts and will not be taking up new posts in order to demonstrate that there will be no “business as usual” until we have a commitment from our universities to fair pay in higher education. We recognise that this is a significant step for any professional to take but urge other external examiners to follow our lead. I am sure like me you choked on your cornflakes this morning when you read about the latest round of pay increases for vice-chancellors (VCs) and principals. The comprehensive survey by Times Higher Education magazine shows a latest annual increase in pay and benefits (excluding pensions) of 6.1% for those at the top. One in five universities gave their leaders a rise of 10% or more. The Times Higher Education compares that to an average increase of 1.3% for staff over the same period. Yet while university leaders have received pay increases many times higher than inflation, the final pay offer to staff of 1.1% is described by the employers as the “very best offer” possible. This simply cannot stand. The union’s higher education committee (HEC) has agreed a comprehensive programme of industrial action aimed not just at improving this final offer but also persuading the employers to address the gender pay gap and the growth of casual contracts. Please give the union your support starting with the two days of strike action on Wednesday 25 and Thursday 26 May. You can read about the Times Higher Education VC pay survey here. You can read UCU’s response here. You can read about our programme of industrial action here. Open meeting – all staff and students welcome. You do not need to be a member of a union to attend. Adam Lincoln, regional UCU representative debates Paul Stephenson about the current dispute over redundancies at Surrey from 5.30pm on BBC Radio Surrey Drive programme on 17th April. Click on the link above to listen to the programme. Please contact Euclid Pires at epires@ucu.org.uk in the regional office, preferably by email, providing the correct mailing address at which the ballot paper should have arrived and your membership number (if known). If the ballot opened less than a week ago, you may be asked to wait a few more days to see if it arrives. If a ballot paper has already been sent to you but does not arrive, UCU can ask the scrutineer to issue a duplicate ballot paper, which will come with a duplicate declaration form on which you will be asked to declare that you have received only one ballot paper. I’ve just joined UCU, can I be sent a ballot paper? You can contact Euclid Pires at epires@ucu.org.uk in the regional office to request one. But a ballot paper cannot be sent to you until your membership has been confirmed by UCU’s membership department at head office. Please contact epires@ucu.org.uk in the regional office, who will make sure our records are updated. Please destroy the ballot paper. I received a ballot paper and I shouldn’t have done/I haven’t received a ballot paper but I should have done – is the ballot now invalid? No. Although UCU does its best to keep membership data up to date at all times, it is data which by its nature changes daily and it is unrealistic to expect 100 per cent accuracy at all times. The statutory requirements that apply to industrial action make allowances for minor errors of a scale unlikely to affect the outcome of the ballot. I didn’t receive a ballot paper, can I take part in the action? If you were entitled to vote, but didn’t receive a ballot paper through an error or lost post, you can still take part in the action. I joined the union after the ballot had closed, or after the call to take industrial action had been made, can I take part in action? Yes. If there is a call to take industrial action, you can take part in that industrial action as soon as your membership has been confirmed by the membership department at UCU’s national head office. Please wait for this confirmation before you take part in action. Why is ERS’s address on my ballot return envelope slightly different to their registered office address? Running ballots all the time, ERS receive so much post that they have special arrangements for receiving ballot returns via a main sorting office. All their mail is ultimately delivered to the same building, and any ballot paper sent in the pre-paid envelope provided or returned to their registered office address will reach them. We have received lots of really pertinent questions about the Operational Review. We will keep this post updated with frequently asked questions and answers. What legal support is available to me as a member of UCU? Many will be extremely anxious about the proposal to cut up to 100 posts at the University. This is an unprecedented attack on the Surrey workforce and will be resisted by your union collectively. Understandably, you may believe there is a legal remedy to your post being put at risk. Unfortunately it is highly unlikely there is such a remedy. UK law is clear that if the following criteria are met redundancies are lawful. The focus is not on whether there is less work, but whether the employer can demonstrate a need for fewer employees to carry out the work. You will no doubt have more legal questions. For this reason UCU in association with Thompsons Solicitors will be holding a presentation and Q & A on Wednesday 15th April at noon in Teaching Block 18. This will be followed by a limited number of very brief one to one sessions. If you wish to have a one to one please contact Euclid Pires at epires@ucu.org.uk who will assign you a time slot. Is the enhanced voluntary severance package on offer at Surrey really generous? Here are some examples of voluntary severance offers in similar institutions. Aberystwyth: http://www.aber.ac.uk/en/hr/employment-information/vs/ One month for each year (max 12 months) and full, unreduced pension for older members of staff. Our management will no doubt argue that there is a fixed budget for voluntary severance payments but it’s worth noting that, in spite of much talk of of financial pressures due to the general economic climate the university budget is in surplus; our Vice Chancelor is the 10th highest paid in the land and we are investing huge sums in new buildings. The Vice Chancellor has launched an Operational Review threatening 100 job losses across the university. The proposals include the restructuring of both academic and administrative departments, with many colleagues forced to compete with each other for jobs in the new structure. It is important that we support each other and work together to protect our livelihoods and working conditions. There are a number of things that we can do collectively as a union, in addition to providing support for members at risk of redundancy. Our branch will need to decide together what action we plan to take in response to these proposals. Come to our branch meeting on Wednesday 25th March, 12-1pm, 19 AC 03, to discuss and vote on our strategy. Information about the Operational Review can be found on SurreyNet. The consultation period for the proposals ends on 8th May, but we will need to act much faster than this to make our voices heard. We are much stronger if we act together. Even if your job is not currently at risk, please get involved now to support your colleagues and protect our university from further cuts. 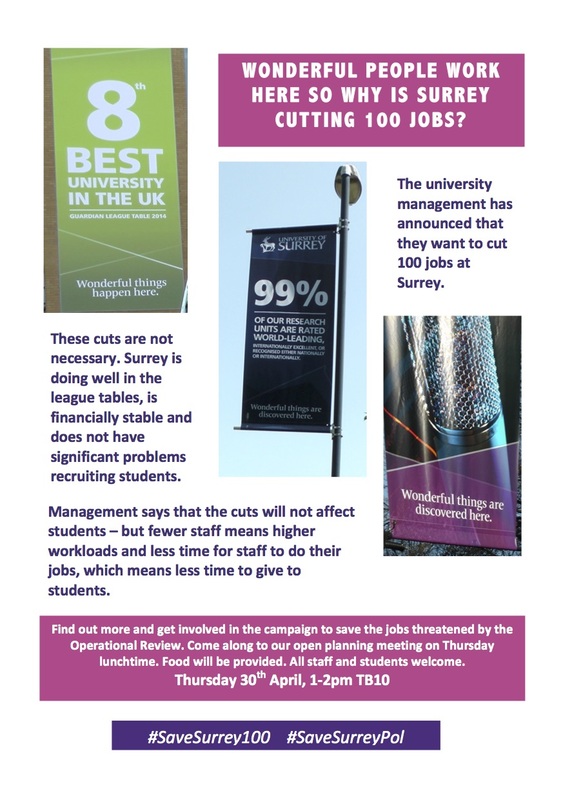 After recent announcements in relation to teaching allocation, it is clear that job losses will mean much higher teaching workloads for staff that remain at Surrey. In addition to the branch meeting next week, there are also meetings taking place in departments particularly threatened by the proposals. Contact your departmental or faculty representative to get involved. Do you earn over £100,000? 47 employees at Surrey earn between £100,000 and £399,999. See the full UCU report. Professor Sir Christopher Snowden survives on £392,000 salary. The Vice-Chancellor of Surrey, Chris Snowden, gets a salary of£392,000. In 2013-2014 he got a 4.3% increase. His salary is 8.5 times as large as the average staff salary at Surrey. According to the UCU report compiled from FOI requests, he spent just under £7000 on Business Class flights in the year covered by the report.